How did the Ponte Vedra Beach real estate market fair in 2016? Are homes for sale in Nocatee selling? Are the Jacksonville Beach, Neptune Beach and Atlantic Beach real estate markets as hot as people say? Is a real estate bubble in our future? As the year comes to a close, I thought it would be helpful to do a market recap for the main beach areas to give readers a sense of what the Northeast Florida beaches real estate market really looks like from a numbers perspective. This is part one of a two-part series covering the Ponte Vedra Beach/Nocatee real estate market and the Jacksonville Beach/Neptune Beach and Atlantic Beach real estate markets. Since the real estate bubble of 2007 and when the Ponte Vedra Beach real estate market hit rock bottom in 2010, there has seen a steady, consistent climb in home prices. 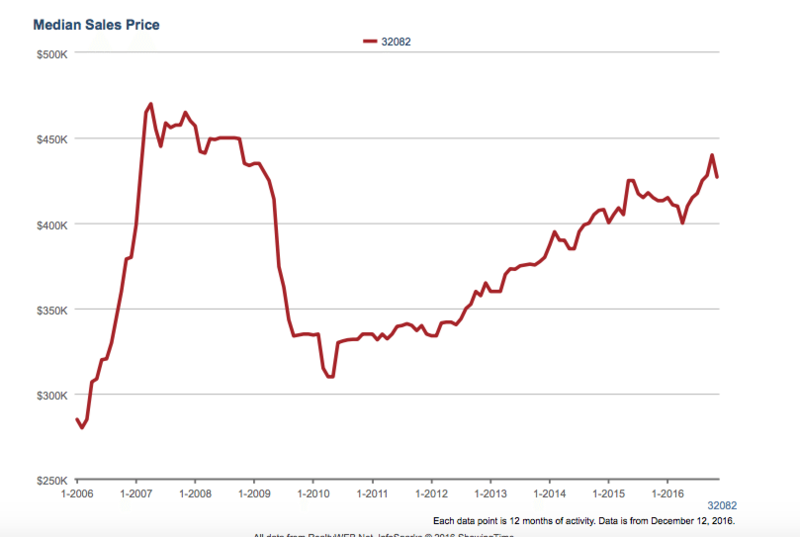 The graph below shows you median sales prices for the whole of the 32082 zip code. The high median sales price in Ponte Vedra Beach was in April of 2007, at a closed sale price median of $470,000. This year, the high median sale price was in October, at $440,000. The overall median sales prices is up 3.3% from last year. The over $800,000 price range has seen the highest gains in the last year, where the median home sale price is up 8.6% over last year, while the $250,000 to $500,000 price range is up 4.3%. The $500,000 to $800,000 market sale price is up 2.2%. There is 6.8 months worth of inventory right now out in 32082. In real estate, months supply is the parameter used to determine whether you have a buyer’s market or a sellers market. Based on the average, the real estate market in Ponte Vedra Beach is a slight buyers market (anything over 6 months is a buyer’s market). But keep in mind, that takes in all price ranges. If you break it down by price, there is a slightly different story to tell. The $250,000 to $500,000 market only has 3.9 months worth of supply, while the $800,000 plus market has 14.9 months of supply. The middle range of $500,000 to $800,000 has a current 8.5 months of supply. Price is often the biggest driver to determine which homes go under contract the most quickly. With millennials now flooding the market and starting families, the lower price points are a big deal, and thus that inventory is moving fast. 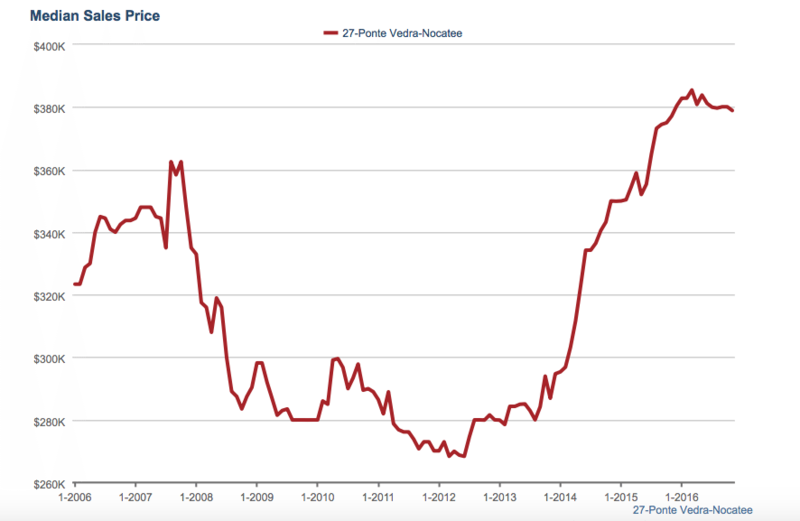 For the higher price points, it’s about pricing the home at Fair Market Value (FMV). Let’s take Marsh Landing for example. If a home sells $850,000, the next seller up to bat needs to understand that their similar home in the next few months will likely sell around the same price, not 10-15% higher as they might like it to. Prices are increasing but not so dramatically month over month. The second thing that makes a house sell in the Ponte Vedra Beach real estate market is renovations in the last two to vie years, unless the homeowner is such a trendsetter they were ahead of the curve. Circa 2000-2004 style is not going to sell at a premium. It will sell, yes, but at FMV, or slightly less. Today’s homeowner is going to calculate out the cost of renovations and subtract them from the purchase price unless you’ve already done that math for them. Why? New inventory homes up the street in Nocatee. What About the Nocatee Real Estate Market? Nocatee is giving the older homes for sale in Ponte Vedra Beach some fierce competition. There are so many choices in Nocatee. The price point is accessible to first time home buyers as well as those with a larger budget, and the homes are brand new. The builder design centers are on top of all of the style trends, so for a newcomer to the area, the logic of buying an older, dated, more expensive house in Ponte Vedra Beach over a brand new home just minutes away is hard to follow. Here’s a look at the median home sale price in Nocatee over the last 10 years. The median home sale price in Nocatee for November was $378,895. That’s up .5% from the same time last year. What’s really more interesting in the Nocatee market is the sales volume and what you get for your dollar. November of 2016 showed the highest number of closed sales in Nocatee over the last 10 years, with a total of 849 homes closed, up 29.4% over last year. The median price per foot in Nocatee is $157 for the same month, which is up over 6% from last year. The Ponte Vedra Beach market (using 32082 as a whole) saw 790 closed sales in November, which is down 5.5% from last year and the median price per foot was $192, up 6.1% from last year. Nocatee has a 3.9 months supply of homes, which indicates the builders can’t build fast enough and people are lining up to live there. One additional interesting data point between the two markets is that currently Nocatee homes are going for 99% of the list price. That is high. The average list to sold ratio in Ponte Vedra Beach is around 96%. Is Ponte Vedra Beach Going to Experience Another Real Estate Bubble? And, Will Everyone Flock to Nocatee? This part of the article is all opinion. No, Ponte Vedra Beach isn’t hitting a bubble. And no, beach residents need not worry that Nocatee will take over. For the latter, Nocatee is the shiny new object. It won’t always be, the inventory will eventually sell out, and Ponte Vedra Beach proper has the much higher land value. Ponte Vedra Beach homeowners just need to be aware of their competition up the street — take care of your home and expect to price it right if you haven’t done a recent update. As far as an upcoming real estate bubble, I really like this article from Forbes. Key signs of an impending real estate bubble are shaky mortgages, over leveraging of assets (due to mortgages), home prices exceeding annual salary increases, increasing interest rates, and foreign demand. Unless something changes dramatically with the Trump administration, the mortgage business isn’t going to see a ton of deregulation. I don’t think anyone wants to go there again. They’ve made it hard for home buyers to over-leverage themselves. The national average salary increase is around 3% annually. That’s pretty in line with the average sales price increase in the Ponte Vedra Beach real estate market and below the average price increase for a Nocatee home. Interest rates have increased by about a .5 % in the last month, which might slow some buyers. But relatively speaking, they are still quite low. Anyone out there buy a house in the 1980s or 1990s? What about foreign demand? It is a factor in the real estate bubble recipe. But, let’s get real folks, Ponte Vedra is beautiful, amazing and a great place to live, but we aren’t yet in competition with Miami and LA. I’m not too worried about a decrease in foreign demand in our area. Note: All real estate data has been pulled from the Northeast Florida MLS.